Property Size 1,430 sq. 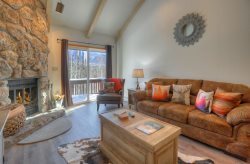 ft.
Durango Colorado vacation rental condo known as Mountain Rendezvous. This three bedroom, three bath condo is decorated with country charm and colorful accents throughout the home, providing comfort and style for many different guest combinations with a two minute drive to Purgatory Resort and about a 28 minute drive to downtown Durango. The ground-level entrance leads through a cute foyer into the main level living space which includes a cozy two-part living room with wood burning fireplace, large TV w satellite service and one sleeper sofa. Access to the large deck with gas grill, outdoor dining and mountain views is granted through a large glass sliding door from the living room. Also on the main level is the beautifully-crafted country farmhouse styled gourmet kitchen with modern appliances and a complete set of cooking utensils and dining ware. Next to the kitchen is the large, family-styled dining table with and decor to satisfy the discerning guest. A laundry closet with full-sized washer and dryer, plus a powder room bath are also located on the ground level. Upstairs, a short hallway leads to the romantic master suite. This honeymoon quality bedroom suite includes a beautiful and comfortable king size canopy bed, sitting area with TV, an elegant master bath with dual vanities and full shower bathtub. This bedroom suite is wrapped in rich colors and decor to create a cozy rocky mountain nest as a retreat from the days activities. The second bedroom is a romantic suite in its own right, with queen size bed, rich decor and a 3/4 bath, plus large walk-in closet and dressing chamber. For guests needing more sleeping areas, this bedroom includes a spiral staircase that leads to a loft bedroom with a queen bed. This home is surrounded by tall aspen trees and glacially-carved cliffs, making a most spectacular site for fantastic views during the golden fall color of autumn. Mountain views can be seen from many windows, the large deck and even the two parking spaces located immediately in front of the condo entrance. Three bedrooms; one king, one queen and one queen 2.5 bathrooms. 1 full with tub shower combo, One 3/4 with a shower only and a powder room. We loved the condo and how welcoming it was. It was a great location for sking at purgatory. We did try to use the community hot tub, but were told we had to leave because some one had rented out the whole place? We were a little confused on that. There are two hot tubs on the property. One in the lodge is not for use by our guests. the other is an outside hot tub located to the south of the condo in between some of the buildings. Good place good location! Only issue we had was the pillows were alil uncomfortable! This is one of the coziest places we've ever stayed in Durango. Close to the ski slopes but away from it all.